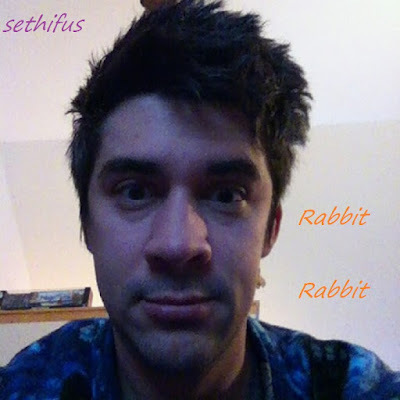 From the Ponder Couch: Rabbit Rabbit! The New Album of Recent and Older Songs! By smethvelous! Rabbit Rabbit! The New Album of Recent and Older Songs! By smethvelous! I made a newish album! You should go download it! This is how I've advertised it on socially media-crity! Songs about everything from Netflix to Horror Vacations to Poop to Olive Oyl to words made from other words! 14 songs! Many less than 1 minute long!" It's pretty good, I think, for being a bunch of audios from youtube videos! Or you could just go to youtube to mp3 . com or whatever and convert each video by yourself for free, but who's got that kinda time?! Dogwood is my favorite rabbit, rabbit! French Stewart, Neighbor - the actual song! Fart Baby and Teeth Are Not for Biting!